It’s common for new products to leverage existing brand names. This could be line-extension – a new variety of an existing brand in the same category; or a brand-extension – a new product in a new category using an existing brand name. In either case, the new product can take advantage of the brand’s existing equity which will typically lessen barriers to trial among consumers and improve the chance of gaining distribution among retailers, among other potential benefits. It is much less common for new products to be released under a completely new brand name. It happens when manufacturers enter completely new categories unrelated to existing brands; or when leveraging existing brand equities is inappropriate for the product’s proposition. We examined the MSW●ARS advertising database to provide an estimate of how common this is. The fact is, it is comparatively rare, with only between six and seven-percent of new product advertising tests being conducted for products with completely new brand names. That being said, there are a huge number of new products introduced each year and so that six to seven percent actually represents a very large number of new brand introductions annually. 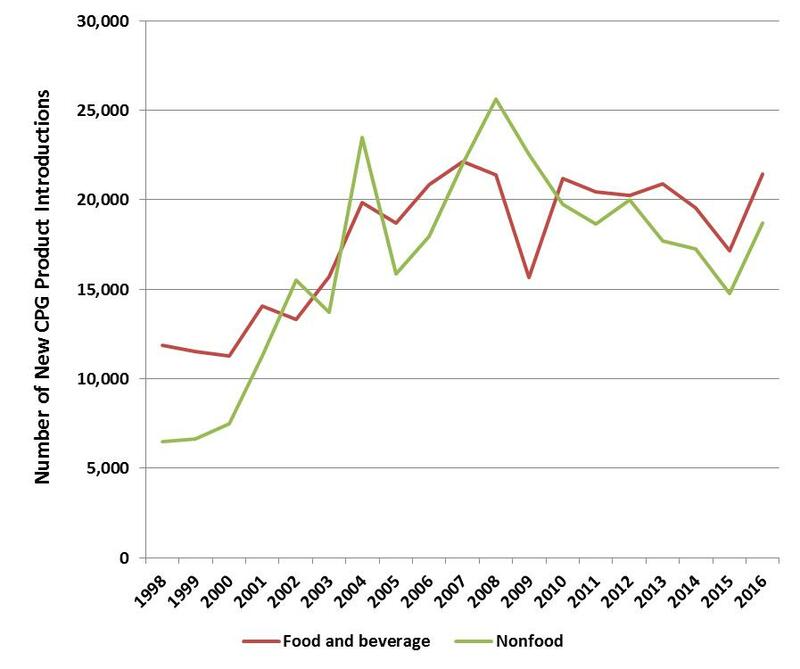 This is illustrated in the following chart, which shows the trend in U.S. new product introductions among consumer packaged goods between 1998 and 2016. The chart also shows a strong uptick in new product introductions in 2016, as brands try to take advantage of a strengthening economy and the associated phenomenon of consumers being more willing to try new things. In this environment, completely new brands are not only more likely to be tried by manufacturers, but they’re also more likely to be tried by consumers. While there are many challenges for a new product before launch, once it is in the market it is imperative that the product gain awareness and sufficient trial to earn continued support among retailers in order to maintain distribution and shelf space. For a new product with a completely new brand name this can be challenging. We examined the MSW●ARS database and looked at new product advertising and compared Related Recall levels for ads for completely new brands versus those for line- and brand-extensions. Note that the Related Recall measure is designed to capture the efficiency of creative to breakthrough and create a memorable impression of the advertising and this metric has been strongly linked to movements in awareness. 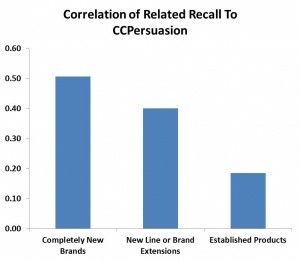 We found that, on average, Related Recall levels for ads for completely new brands are only 64% of those for other new brand ads. Clearly ads for brands with completely new names struggle to create a strong branded impression in the minds of viewers. Established brand names already have associations in the minds of consumers which ads for a line- or brand-extension can tie into and more easily leave a lasting impression. Ads for a product with a new brand name are starting from scratch – a much more daunting task. To further illustrate the challenge, we used the MSW●ARS new brand awareness model to compare average ads for completely new brands versus those for other new products. We found that in order to gain the same level of brand awareness as an average ad for a line- or brand-extension at 1000 GRPs, an average ad for a completely new brand would require about 1450 – a substantially larger media investment. Taking steps to improve an ad’s ability to break through will not only help build awareness with a lower media spend, it will also help nudge viewers toward trial. 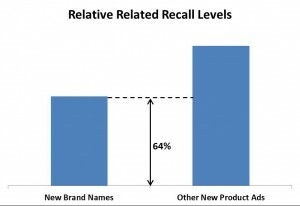 There is a significant relationship between an ad’s Related Recall level and its level of persuasiveness (as measured by the MSW●ARS CCPersuasion measure, which has been shown to be strongly correlated to new product trial level and is predictive of the magnitude of market share gain for established products). And in fact this is especially true for completely new brands. So how can a completely new brand improve its communications and make it more likely that the brand name registers and persuades consumers to try the brand? Here are 5 empirically supported methods which can help new brands do just that. Analysis of the MSW●ARS copy-testing database indicates that sufficient branding is beneficial for all product types, but for completely new brands it is vital. Two proven measures of branding are the number of times the brand name is spoken and how long the brand name or logo is shown on-screen. 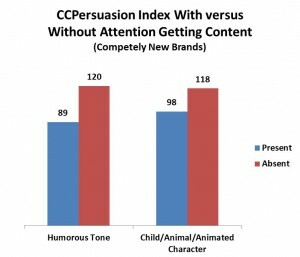 As can be seen in the following chart, completely new brand 30-second ads incorporating these branding elements realize a boost in Related Recall about five times greater than that realized by other new product ads. The use of shorter ad lengths can be especially challenging for completely new brands. 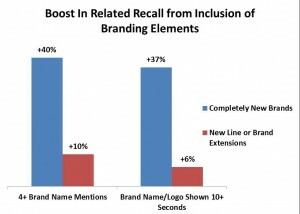 While the number of 15-second ads for completely new brand names in the MSW●ARS database is relatively small (reflecting the fact the few even attempt this), it appears that Related Recall levels for these ads versus other new product 15-second ads are at a ratio even lower than the 64% level seen across all ad lengths. One driver of stronger CCPersuasion levels is a brand name which reinforces a product benefit. 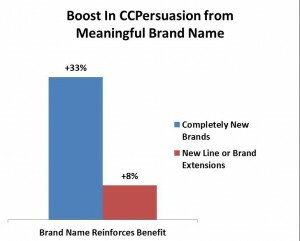 While this may not be easily actionable for established brand names, it is obviously something a completely new brand can benefit from – and as the following chart shows, the benefit they receive from utilizing a meaningful brand name is substantial. So invest in your name. There are certain attention-grabbing executional elements which tend to increase Related Recall levels while being neutral towards an ad’s persuasiveness. However, data for two such elements that we looked at suggest employing such gimmicks for completely new brand advertising may often backfire. So stay away from gimmicks and stick to your message. A completely new brand needs to find a way to convince consumers to choose it over what they currently use. 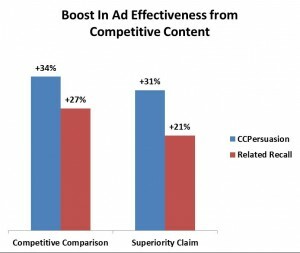 In pointing out how they are unique and different from the competition, such brands should not shy away from comparing and claiming superiority, as these approaches have a strong track record among completely new brands in terms of both CCPersuasion and Related Recall. Just make sure you can back it up. Please contact your MSW●ARS representative for information on how our communications research tools can help your brand win in the marketplace. Younger viewers watch more Online Video than Live TV – don’t worry though, we have tools for both. Millennials and Private Label – a Blossoming Problem for National Brands?